We all love Rugs right?? 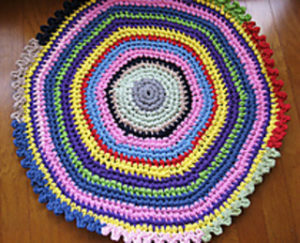 If it is a Crochet Rug, and what if you can make with your own used T-shirts. How?? Make T shirt Yarn from them. Awesome way to be and Eco-Friendly Crocheter right?? So Yes we do support going eco-friendly for possibly everything you can and hence we will say this is an awesome project to make your home beautiful in a way where we help the environment. Of course, you can also donate your T-shirts if you think someone can still use them. But if they are in bad condition you can just do this. Cut it and make it into a T shirt Yarn instead 🙂 We have listed some Crochet Rugs you can make out of your own T shirt Yarn. T-shirt Yarn Rug by Mollie Makes made with a 15mm crochet hook is very colourful and lovely pattern. 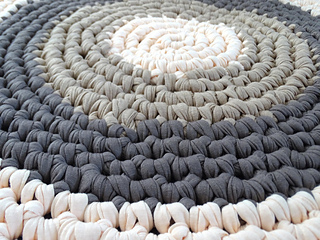 Alfombra de Totora/ T-shirt Yarn Rug by Laura C. L. Van Dam is simple pattern making Scs of a different Yarn over the T-shirt Yarn. 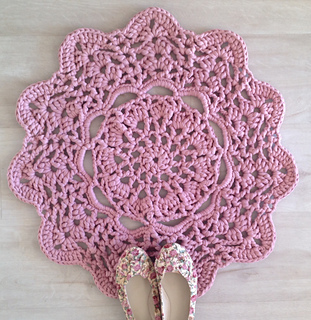 Lacy doily t-shirt yarn rug by Anneke Wiese is a lovely pattern done with a 12.75mm crochet hook. The pattern is written in 2 languages. Look closely for the English version in every step. 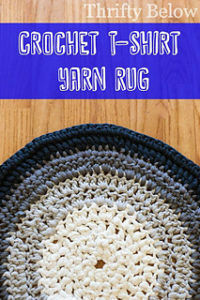 T-Shirt Yarn Rug by Alex @ Thrifty Below is beautiful and lovely pattern worked in simple rounds. 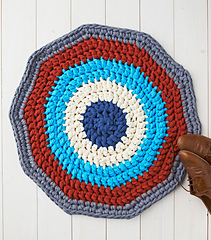 T- Shirt Yarn Round Rug by Meladoras Creations is beautiful rug done with a 10mm crochet hook. 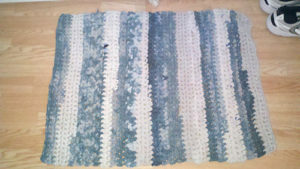 Recycled T-Shirt Rug by Gwen Farewell made with some used T-shirts and a 15.00 mm crochet hook. 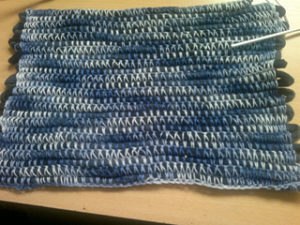 It is available as a Ravelry download. 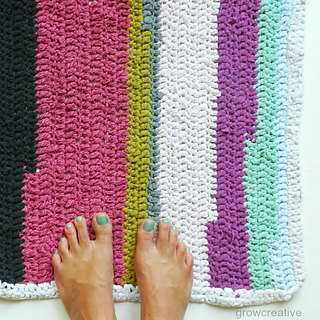 Amazing Technicolor T-Shirt Yarn Rug by Donna Martinez is lovely multicolour Crochet Rug done with a 15.00 mm crochet hook.The pattern is available in a PDF form which you can download from the link. Crochet T-Shirt Rug by Elise engh a is a lovely rug made with a 6.5 mm crochet hook. 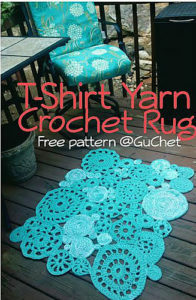 T-Shirt Yarn Rug by Gu’Chet is a pretty pattern available as Ravelry download and done with a 10.00mm crochet hook. 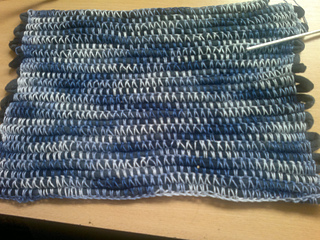 Chunky Hexie t-shirt Yarn Mat by Cintia Gonzalez is a lovely pattern done joining Hexagons. The Pattern is quite easy to follow. Gorgeous Mandala Floor Rug by Marinke Slump is lovely pattern worked in rounds with a 15.00 mm crochet hook. 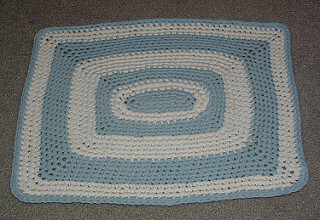 Blue & White T-Yarn Rug by Cindy RecycleCindy made with a 9.00 mm crochet hook. It is a rectangular Crochet Rug. Which one will you make? Select one and grab some used T shirts now. 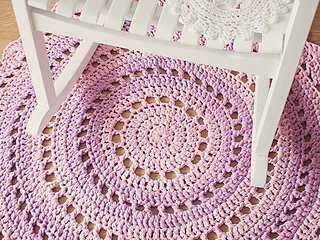 Make your house colourful by choosing one of these beautiful rugs.